Sherri is a Special Agent with the Kansas Bureau of Investigation. She was elected to serve as President of the Kansas Peace Officers Association on October 17, 2018 and is the first female president of the association. The start of spring is a good time to clean out the old, freshen things and launch a new and improved KPOA website!! The new site will allow our members to have access to timely legislative information, upcoming training and the most recent point of law updates. Members and agencies will be able to renew and pay for their memberships and sign up for FREE KPOA sponsored training for members on line as well. With this new website KPOA hopes to keep you informed and up to date. Thank you to ALL who have assisted in making this happen, and continue with valued participation. KPOA is a remarkable organization and thank you for choosing to be a part of it. Spring will bring new challenges for us; whether we seize them or not and it will bring new opportunities. As we seize these opportunities and face these challenges know you are truly making a difference in the community you serve. Your dedication, service, and integrity is invaluable and vital in today’s world. 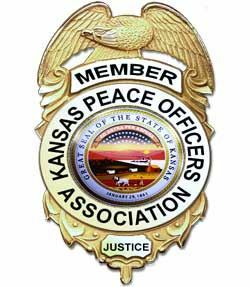 The Kansas Peace Officers Association has been a part of the law enforcement community for over 100 years now and I am privileged to be the current president of this worthy organization. The KPOA encompasses all levels of law enforcement including Chiefs, Sheriffs, and street officers, local, state, and federal officers. As law enforcement officers, we often face many prejudices and challenges in our daily responsibilities. It is imperative we continue to educate the public, share our challenges and continue to keep our communities safe. At the same time providing services to those who need a counselor, social worker, protector and so many other roles encompassed by law enforcement officers in today’s world. The KPOA strives to provide quality training to its members throughout the state to assist with some of these challenges and roles faced daily. The district Governors have been instrumental in assisting with arranging training and for that, I thank you. I hope 2019 will encourage all districts to provide FREE, quality training to KPOA members throughout the state. Thank you to all who attended our fall conference in Lawrence. There were fantastic speakers who shared their experience and knowledge, old friends reuniting and new friends being made. A raffle also occurred at the conference raising $2655.00 for the family of Sedgwick County Deputy, Robert Kunze. The generosity of the sisters and brothers in blue is awe-inspiring. KPOA continues to provide our members with representation at the legislature with retired Chief, Ed Klumpp. Mr. Klumpp works tirelessly during the legislative session working with Kansas lawmakers on proposed bills that could impact law enforcement. KPOA is trying to establish an email data base to better communicate with its almost 3300 members. This will allow us to blast email training information and other information of value in a timely manner. Please make sure KPOA has your CURRENT email information. If you are a member, please login to this site to ensure we have your current e-mail on file. While your logged in, please also verify all of your contact and beneficiary information is current. I know you have the choice to belong to other organizations and appreciate you choosing to belong to the KPOA. As your president, I hope to continue to advance and grow this remarkable organization and membership. I cannot do that alone and each member’s active involvement is needed and greatly valued. Thank you for your dedicated and crucial service in law enforcement. The work you do is remarkable and does make a difference.